The hotel and resort business is often based on reputation. See what guests think about the experience at your hotel by sending them this hotel survey. This hotel survey template offers customizable questions about guest satisfaction for collecting meaningful feedback on any aspect of the hotel or resort, such as front desk service, room service, room quality and size, hotel food quality and overall experience with the hotel/resort, from check-in to check-out. Use this hotel survey form to discover opportunities for improvement and make sure your hotel is getting a five-star rating. To customize this template after signing up, choose ‘Hotel Survey’ as example when creating a new survey. Clearly establish what you want to achieve with your hotel guest questionnaire. Of course, you’ll want to identify operational or staff problems, but also take this opportunity to ask a hotel guest survey questions that provide specifics – i.e. why did they choose your hotel, how did they hear about you, how was their overall experience, what would have improved their stay? Knowing what you want will help you strategically shape your questions best fit to achieve your goal. Use concise, simple language. As a hotel, many of your guests may not be native English speakers – so keep this in mind when creating your hotel customer survey. This simple tip can vastly improve your response rates, and foreign visitors will appreciate the effort. Offer an incentive. Giving your guests an incentive to complete your hotel feedback survey can increase response rates by up to three times. Something like a free dessert in your hotel restaurant or a discount on their next stay can be quite effective. You are then providing them value on top of the commitment they already made. Why use the SurveyAnyplace Hotel Survey Template? Take your reporting to the next level with Data Filters you can customize to gain actionable insights from guest feedback. Share reports publicly or privately, create real-time presentations and effortlessly export your survey data to CSV or PDF. Create a hotel guest satisfaction survey as glorious as your establishment. Experiment with background images, fonts, layout and design for a customized, on brand survey. 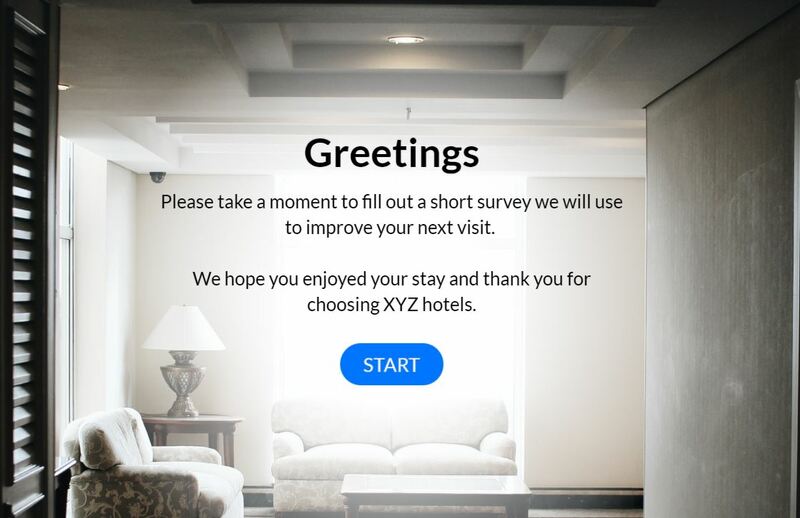 To use this sample hotel survey, sign up for Survey Anyplace , and choose ‘Hotel Survey’ as template when creating a new survey. It is important that the data can be recorded efficiently and that it is easy to analyze: Mobile devices such as a tablet or smartphone are ideally suited for this. Our survey maker tool is equipped with a mobile-optimized interface to ensure a user-friendly experience. (Making it easier for guests to provide feedback on their mobile devices, and increasing response rates so you receive the data you need.) This can also be done by paper forms but that carries the disadvantage that the data still needs to be uploaded to a computer and this is a tedious, error-prone task. Improve your guests' experience and optimize your hotel to achieve the highest of standards.